At home tonight, varsity boys' basketball faces Roselle Catholic in the NJSIAA sectional semifinals. 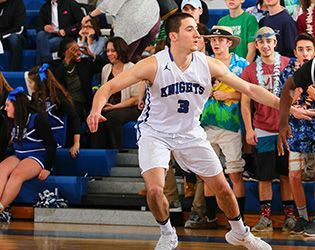 Coming off a decisive 81-53 over Wildwood Catholic on Friday, the fourth-ranked Knights look to oust the fifth-ranked Lions and garner a spot in the sectional finals, which are scheduled to be played at Jackson Liberty High School at 7:00pm on Wednesday. Friday’s quarterfinal matchup indicated that the Knights have the talent and depth to go the distance in this year’s state tournament. Sophomore Paul Mulcahy led the charge, with 20 points, 10 assists and six rebounds, backed by senior Michael Morreale, who recorded 13 points. A trio of sophomores, Alex Schachne (11 points, 11 assists and six rebounds), Brad Bundschuh (10 points) and T.J. Chaney (nine points) augmented the team’s dominating performance. Additional baskets came from throughout the roster, with Evan Storch '17, William Yarbrough '18, John Yoss '18 William Soucie '20 and Parker DeMaira '20 rounding out the scoring and keeping the Crusaders off balance. Fans are encouraged to come out and support the Knights in this last home contest of the season. The game begins at 7:00 p.m. in the Athletic Center.